Hunt down the evil "Big Mama" Grimmoc in this all new chapter. Assemble your team and revisit the stunning realms of Ancaria! © Copyright 2013 and Published by DeepSilver, a division of Koch Media GmbH, Gewerbegebiet 1, 6604 Höfen, Austria. All rights reserved. Developed by Southend Interactive AB. 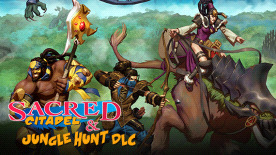 Sacred is a registered trademark of Koch Media. Southend Interactive AB and its associated logo are trademarks of Southend Interactive AB. “Deep Silver” and the Deep Silver logo are registered trademarks of Koch Media GmbH. All trademarks of each party and trademarks within the Game IP shall be identified using the symbols ® or “TM” (as the case may be).